Having observed pensioners unable to walk far and stranded on benches, their dogs listless or straining at the lead, Pae White designed her ‘Barking Rocks’ park especially for the needs of both: now the elderly can rest and chat or picnic while their dogs exercise and play. The site itself, sandwiched between the main shopping street and The Leas promenade, had long been neglected and is now transformed into what the artist calls “landscape theatre”. Sculptures of cats’ heads ominously stuck on nine-foot-high poles are a dramatic (if tongue in cheek) warning to those not invited here. ‘Barking Rocks’ is a social sculpture on several counts: it reclaims derelict land, returns it to the community, and privileges, in a playful way, the disadvantaged, both human and canine. Los Angeles based artist Pae White is a devoted dog lover, so on visiting Folkestone she was pleased to see so many of the town’s dogs and owners enjoying the sea air and public spaces. She couldn’t help noticing however that many of the dog walkers were quite senior and perhaps a little less energetic than they once were. White felt that the playful and inquisitive nature of their dogs was literally being reined in. Plodding along on a short lead or tied to a bench whilst their elderly owner rested, life for a Folkestone hound seemed in need of some new stimuli. White’s creativity has been well and truly unleashed, drawing inspiration from dramatic locations like the Giants Causeway in Northern Ireland, to create what she describes as a theatrical jewel. 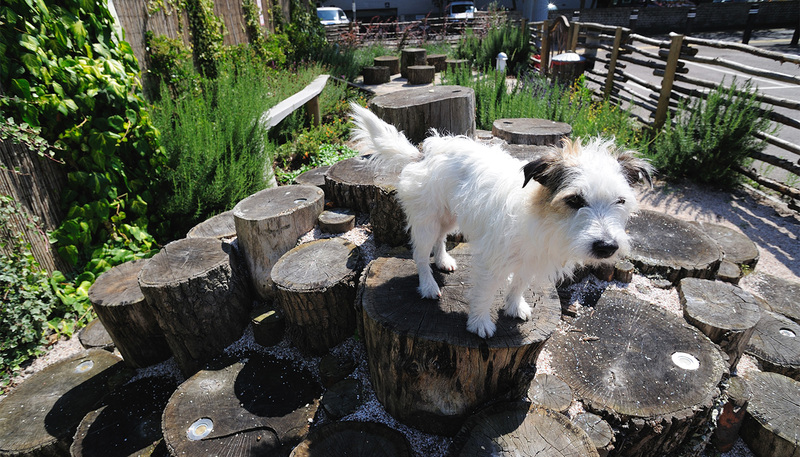 This formerly disused plot of land is now a compact and bijou oasis, where dogs can climb and explore. White appears to have thought of everything, the plants have been selected to disguise any unwanted smells; cats heads mounted on poles clarify any potential confusion over the intended clientele. It is a work of social sculpture, providing both a practical public use and a genuine spectacle to stop passers-by in their tracks.